When you look at the history of horseback riding, considering the history of domesticated animals is key. Animals including horses were domesticated approximately 10,000 years ago, not for horseback rides but as a source of food for people. Wild equines were hunted for meat and hides like other wild animals. When tame horse herds were finally kept it was for the purpose of having food, but not having to go out and hunt for it. Most likely horses kept for this purpose were not tame by our standards but probably were either deliberately hurt so they couldn’t run away or kept hobbled. The all important first ride in the history of horseback riding came about around 4200bc. This made it much easier to watch over the horse herds people kept as well as to herd cattle and sheep. As you probably know if you’ve ridden before, it is much faster to get around on horseback than on foot! Riding a horse made it much easier to keep up after bigger groups of livestock. After people started mounting up, many were able to increase the size of their livestock herds and their earnings, too! All of this was because of horseback riding! As you can imagine those equines were still harder to control than a cow or sheep. When you add riding into the mix, people had to be able to have more control over the horses’ head than the halters used for leading and tying offered. I bet you can tell me what all important piece of horse riding gear in the history of horseback riding was invented next? The first bits weren’t made of metal because metal working wasn’t invented yet. Other types of riders used different bridles. The Native Americans used a cord around the jaw, sometimes called a Cherokee bridle. After metal working came more into the mainstream bits were made of copper, looking just like their rawhide cousins for a long time before all the variations we see today came about. 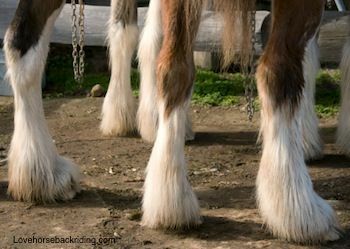 Stirrups were another great invention in the history of horseback riding as before that many miles in the saddle with your legs dangling meant sore and swollen legs. Before the invention of the stirrup, mounting was not easy! More than one warrior that carried a weapon wounded or killed himself with his own weapon trying to get on the horse. 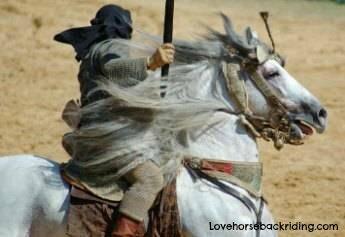 Although not a piece of the riding portion in the history of horseback riding, it would be a big mistake not to include the use of equine power throughout history as pack animals and for pulling loads. Even before the wheel was invented, horses were used to pull a travois, which is two long poles that had material such as an animal skin between them behind the horse. They were loaded with supplies and that were fastened near the horses’ withers on the other end. The travois was originally made to be pulled by dogs but was later adapted for use with horses. With invention of the wheel, horses became even more important. Now they could pull large loads of food, water, and supplies. They could also be used to pull lighter 2-wheeled carts called chariots. Chariots were used for wars and racing. In Rome, chariot racing was an extremely popular spectator sport much like football, baseball, and basketball are today. I don’t know about you, but I would be much more interested in watching a chariot race than a football game any day! In more modern history before industrialization, horses were used for cultivating crops. They were also used for transportation of everything from food and goods to passengers. It was not an easy life for a horse. Throughout history, they worked hard and often died while on the job of extreme working conditions. Fire horses (horses that pulled the fire truck before cars were invented) were trained to run to the fire at the sound of the fire bell where they were unhitched and tied guarded by the Dalmatian Dog. Later, if a fire horse was retired or sold they would not bring a very good price because every time they would hear a fire bell they would take off running towards the fire! 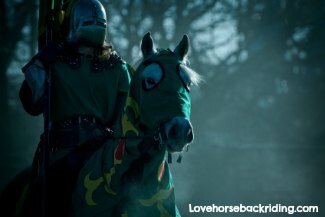 Throughout the history of horseback riding, probably the most famous use for horses has been in wars. From the knights in shining armor off to conquer lands to world war II war tactics, horseback riding has been central to war and conquest. The reason we typically mount from the left side of the horse comes from these warriors. They often carried heavy swords on their left hip, so it was easier to swing the right leg over the horse. Covering more ground as a warrior on horseback meant that you could invade an enemy 20 or more miles away, then quickly head back towards home or base and be back overnight. Throughout horseback riding history they have pulled artillery and supplies, carried warriors and calvary men. This was especially true of the Native American horses when the U.S. army waged war on them. Other breeds went extinct as their uses died out. I hope you have enjoyed this brief glimpse into the action-packed history of horseback riding. Leave history of horseback riding to explore more fun horse topics!